At Crossroad, we exist to help others experience Changed Lives that allow them to Build Relationships, all to the Glory of God. Crossroad Baptist Church serves a wide area stretching across five counties, with people attending from New Carlisle, Springfield, Urbana, Fairborn, Huber Heights, Tipp City, and more. With expositional but relevant messages, contemporary but familiar worship style, and an emphasis on world missions, we strive to create an atmosphere where anyone can feel at home. Crossroad had its first organized meeting at the Recreation Center of the Honey Creek Mobile Home Park in New Carlisle on March 23, 1975. Reverend Larry Spencer was called to be the church's first Pastor on May 25, 1975. Larry continued as Pastor for the next 15 years, leaving in January 1991. In 1976, Crossroad began holding services at the Tecumseh YMCA of New Carlisle. 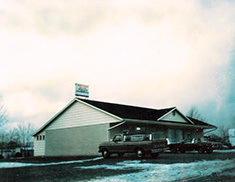 In the late 70s, they moved to the present location on West National Road. In April of 1991, R.C. McDonald became the second Pastor of Crossroad, and remains as such today. In its entire 44 year history, the church has had only two Pastors. Through the years, Crossroad has continued to develop the land on West National Road. Among its five acres, the land now includes the church sanctuary, two educational buildings, a parsonage, and several storage buildings.